The northern part of Serbia is 'big sky country', lying on the vast Panonian plane sweeping down from Hungary. Bordered by rivers on two sides, the countryside is dotted with many small towns, monasteries and castles. 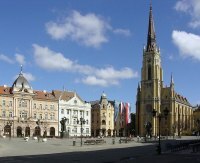 While most of Vojvodina is rural, the capital city of Novi Sad is a bustling city of 400,000 people, acting as the cultural heart of the province. A charming place that blends traditional Serbian culture with a modern way of life, the city has a number of theatres, museums, art galleries, and interesting historical buildings. Novi Sad is also the home of the EXIT Festival, one of Eastern Europe's most popular music festivals. The countryside around Novi Sad and throughout Vojvodina is rich and fertile, providing much of the food for the rest of Serbia. A patchwork of farms and vineyards, this is a great place for outdoor activities like horseback riding, golf, and hiking. Lake Palic is a popular weekend destination, with its art nouveau buildings, 19th-century spa, and excellent restaurants. Other popular towns and tourist destinations in Vojvodina include Sremski Karlovci, Subotica, Paracin, Titel, and Vrsac. A driving tour of Vojvodina is an essential part of any holiday in Serbia, allowing travellers to experience the diverse local cultures that give each town a unique history and personality. We are looking for contributors for our Vojvodina travel guide. If you are a local, a regular traveller to Vojvodina or a travel professional with time to contribute and answer occasional forum questions, please contact us.